Recovery from gun violence is hard enough without being treated as a piece of evidence in the courtroom of the Internet. As the buzz fades, we must not forget those affected. The Internet makes having an opinion and broadcasting it the easiest it’s ever been. All it takes is the push of a few buttons and your thoughts and ideas are instantly available to millions of people to read, critique, or fire back at. While this has created incredible opportunities for personal connection and platforms for underrepresented causes, it’s also allowed those same moments to be questioned, invalidated, and pushed back. We see the same narrative of judgment over and over with sexual assault, LGBTQ rights, and gun violence. A marginalized group’s voice is heard, questioned, and manipulated to sell stories or push the narrative for the left or the right; it is rare that opinions are just heard. With the recent mass shooting in Las Vegas, the gun debate intensifies once again. Tales from survivors are used as poignant emotional appeals for gun control, while the opposition fights back with their own anecdotes and studies meant to justify the presence of the personal gun. There’s a piece this narrative overlooks: While we post on Facebook about how horrific an act of violence this was, there are people trying to understand why their children died at a concert. There are people who won’t feel comfortable in a crowd of people for years, if ever again. Recovering from a traumatic experience is hard enough without being treated as a piece of evidence in the courtroom of America’s Internet. Long after physical wounds heal, emotional trauma remains and is poorly received because it’s not what the public wants to see. Whether a person is shot or not, being involved in a life-threatening trauma comes with some irrefutable emotional consequences. In the short term, a person may go into shock or experience depression. Numbness is not uncommon amongst recent survivors of violence, and community violence may increase the likelihood of suicide. A person may experience nightmares or intrusive thoughts about the incident. Directly after trauma, it is important to pay close attention to physical and emotional needs. For some, this may mean turning off the news and not over-consuming coverage of the event. For others, it may be seeking out friends and family in a comforting environment. For everyone, it will be remembering to eat and sleep and drink enough water. Many victims will experience hyperawareness and possibly anxiety around crowds, strangers, or situations similar to their violent experience. It may be difficult to work or perform normal life activities at first. Long term, the battle is far more amorphous and unpredictable. Some individuals may have high resilience and emerge fine after a few months. Others, however, are at risk for developing ongoing depression, anxiety, or PTSD. There is no concrete list of risk factors to indicate who is more at risk, so it is important for all victims to pay close attention to their emotional well-being. Family, friends, and medical professionals will be integral in monitoring recovery and making sure tools are provided to those who need them. However, for many people, seeking help when it’s needed can be the hardest part of recovery. National tragedies become political cannon fodder as victims’ accounts are leveraged for emotional ammunition. Rather than treating these people and their experiences as up for debate and allowing the majority to argue over whether or not their emotions are valid, we need to be tending to our wounded first. Perhaps that’s a poorly chosen metaphor, but the truth of the matter is that victims of gun violence in our country are briefly held up as examples of what’s wrong with our country, and then set aside with little privacy or stability as the news moves on. We need to prioritize caring for the victims in this situation, rather than telling them what, how, and when to feel in order to push our own agendas. The key is to fundamentally change the way we view mental health surrounding gunshot and gun violence survivors. Unless you’ve been shot, or experienced similarly life-threatening trauma, you cannot understand it. That is the simple truth, and yet, with every public incident of gun violence, we pretend to do just that. It seems that we, as a public, have some sort of omniscient timeline that allows up to know when a period of mourning should have passed. When we’ve decided how long a person is allowed to mourn, we’ve put them in a box and limited their ability to cope in the way that might be best for them. Grieving can be ugly and exhausting, and as a population, we don’t facilitate talking about the hard parts of mental health. In America, we stigmatize treatment for depression, anxiety, bipolar disorder, PTSD, and a slew of other mental health problems. Talk about cultivating joy, creating mindfulness, and practicing meditation are all acceptable forms of self-care for mental health, but should a person require therapy or medication, there’s a kickback against it. Especially in the question of PTSD and recovering from traumatic events, we often greet survivors with choruses of “Haven’t you worked through that yet?” There’s an unproven association between PTSD and a lack of mental strength that we strive to avoid, as no one wants to be perceived as weak, pathetic, or mentally unwell. With the conversation about gun violence and mass shootings so closely intertwined with mental health, it’s no wonder there’s an added stigma for survivors wanting to seek help. The knee-jerk reaction of many media outlets and conversationalists is to tie a violent offender to mental health, creating the idea that those with mental disorders are violent, unhinged, or incapable of self-control. That’s not exactly a mantle someone trying to recover from a violent incident would be eager to take up. Psychological first aid provides triage to those who may be experiencing shock or other reactive emotions in the wake of a violent tragedy. It allows first responders to create a sense of validation for the victim’s feelings of despair, devastation, and fear. The hope is that by validating what someone is feeling and not allowing them to push it down or ignore it, the inclination for depression, anxiety, and PTSD to develop may be mitigated. 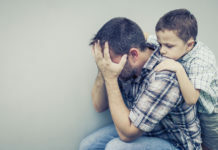 Those administering psychological first aid following disaster also make sure that people have somewhere to go and someone to talk to; leaving people alone in the wake of trauma may be one of the most devastating actions. First responders are trained in communication and response to trauma and shock, but care needs to continue after the initial event, too. Grief and stress following trauma need to be normalized as a reaction. For those who have experienced a mass shooting, hypervigilance, survivor’s guilt, and fear of crowds may influence their ability to resume their normal lifestyle. Beyond immediate psychological triage, victims should also be provided with resources for recovery. The Internet provides a myriad of reading material, lists of psychologists focused on trauma recovery, and the ability to connect with others who may have shared experiences. Accessing these resources without the stigma of treatment will pivotal in a person’s ability to recover. Voices of those who have survived trauma have valuable information and experiences to share with those of us who haven’t, and their voices should be honored rather than manipulated for political gain. Creating a culture of safety and attentiveness for victims will help to encourage their healing and bring light to a previously eschewed aspect of gun violence, especially as mass shootings continue to permeate our news cycle. A massive part of creating a new normal and processing trauma is having a support network. Emotional support and a strong network of people is important for any level of medical recovery. In fact, in order to be considered for certain high risk or elective surgeries, patients are required to have a psych consult and a verified social support network. Family and friends create a comforting reminder of safety and security, attributes which will be in high demand following a violent incident. Those close to a victim may be called on to listen, validate, and care for a person as they work to process and heal. Members of a victim’s support system may need to act as an advocate for when they physically or emotionally cannot stand up for themselves. Making sure the physical and emotional needs of a victim are met will be crucial to recovery efforts. While this can be a trying time for friends and family, it is important to maintain an attitude of patience and understanding as much as possible. Without a comparable experience, it can be impossible to understand what a person is going through. When a victim’s normal social circle falls short, specialized communities may be the answer. Obviously, therapists are trained to help a person process emotions and work through trauma, but additional comfort may be found in support groups or online forums. Victims who are able to relate with others who have experienced similar events recover faster, and may benefit from sharing experiences and breakthroughs with each other. They also know they’re not alone in their journey. Soon, the stories will fade and the debate will quiet, and a vast percentage of the populace will no longer be frantically googling to learn everything about the latest violent perpetrator. As the buzz fades, though, we need to not forget those affected. We owe the victims among us so much more than political noise. We need to strengthen our communities to rally around those who need us and help to lift the stigma around recovering from traumatic incidents.